The Colors Of Indian Cooking: For OXO, Cookies For Kids' Cancer. Gluten Free Everything Cookies! For OXO, Cookies For Kids' Cancer. Gluten Free Everything Cookies! If you love cookies and you want to help fight pediatric cancer, do I have a blog post for you! When I was invited to participate in OXO's blogger outreach program "Cookies For Kids' Cancer" of course I said yes. I had two great reasons. First I love cookies and don't bake them nearly often enough. Second, I'm a cancer survivor myself and am up for anything to help in the fight against this disease. So imagine my delight when I was given the opportunity to bake some cookies and it would be for a good cause. Guilt over copious cookie eating flew out the window. "I have to bake these cookies! It's for a good cause!" What better reason to excuse a harmless indulgence, for after all, isn't this the season of "more please!"? Besides, the whole thing is sponsored by OXO, the makers of some of my favorite products. Cookies for Kids' Cancer was founded by two OXO employees who were faced with their own child's battle with cancer. Every year OXO raises money through bake sales, cookie sales and cookie exchanges. If you're interested in finding more ways to help OXO fight kids cancer, visit www.oxogoodcookies.com and learn more. The people at OXO sent me a free limited edition "Be A Good Cookie" Spatula as part of their Blogger Outreach on behalf of Kids' Cancer Awareness. I was only too happy to give it a try. As I mentioned earlier I've purchased their products for years, and as anyone who knows me will tell you, I've always loved a good spatula. I'm just wired that way. So I was really eager to take it for a test bake. My good friend Terri was in a very very bad horseback riding accident early this last Summer and she's just finally gotten back on her feet again. She didn't have a very fun Summer. To further complicate matters, right before her accident, she was told by her doctor that she was gluten intolerant. Terri happens to be a real champion cookie baker. Every year at our Academy Award party she always brings a big plate of her amazing cookies and we all pig out. I was determined that gluten free or not... those cookies would keep coming. I was going to try and figure out how to do it. It would have helped had I had a recipe, but I wanted to surprise Terri. 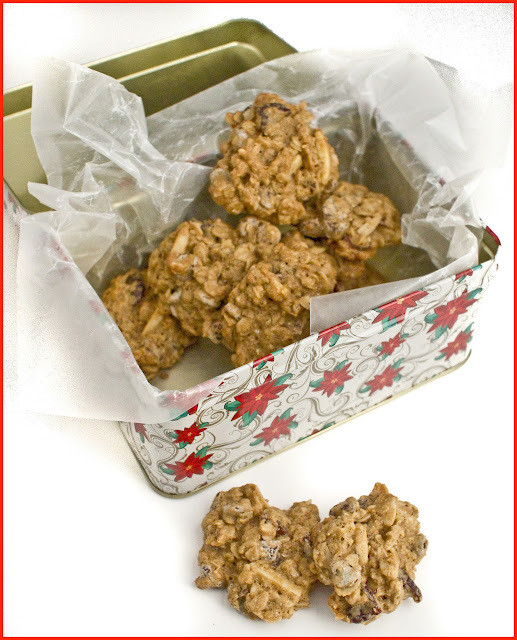 I figured I'd start off with my basic oatmeal cookie recipe and wing it from there. Terri's cookies are a sort of "everything" cookie. They start off as oatmeal cookies and then go to town from there. Studded with chunks of dark chocolate, dried cherries and slivered almonds, these are super delicious cookies. These are little treasure bites of melting chocolate and tart, dried cherries. Do you get how delicious these cookies are yet? These are cookies that don't deserve to have a little matter of gluten sideline them. These cookies deserve to live! The only thing standing between gluten free and these cookies was 1 and 1/2 little cups of flour. To make these cookies I had to replace this flour with a mixture that was gluten free. So I started surfing around and reading about gluten free substitutes. After reading what a whole lot of people were saying, I decided to mix this combo of flours. I sifted it all together so it would be well mixed and then bagged it and called it Terri's Sub Flour Mix. Okay, now I had my flour substitute I was ready to bake Terri's cookies. Take your cookie sheets and line them with parchment paper. Set them aside. In a large bowl beat the butter and sugar together until they're creamy. Add in the eggs and the vanilla and keep on mixing. Add in the flour mixture, a bit at a time. Then add the baking soda, cinnamon, and salt and mix it all together. Mix them in by hand also. *Now here's the secret of Terri's cookies which I didn't have. She doesn't use chips. Nosirree. She uses chocolate chunks. You see, if I'd been paying attention while I was eating them instead of stuffing them in my mouth, I'd have noticed this. The chips are good. The chunks are better. Take my word for it. Drop the dough in rounded spoonfuls onto the cookie sheets. Bake them for approximately 10 minutes or so until they're golden brown. Let them cook on the cookie sheets for about 1 minute, then using the magic spatula, gracefully slip them off the cookie sheets and onto the baking racks. Did Terri enjoy her cookies? You bet she did. Chocolate chunks aside, I think we managed to rescue her recipe and do it totally gluten free! I loved working with that great spatula. Like all OXO products, it feels great in the hand like a part of my arm. I loved it! The next question is, do you want one? How do you get your oven mitts on that groovy chartreuse spatula? Just visit your nearest Bed Bath and Beyond or www.amazon.com. When you buy one you'll be helping to fight pediatric cancer. Because with every purchase of a limited edition, OXO, "Be A Good Cookie Spatula," 50% of the profits go the benefit of pediatric cancer awareness up to $100,000. Or You Can Get One From Me. When the people at OXO sent me this spatula to try, they sent along an extra one to share with one of you. I want to thank OXO for giving me this spatula and giving me the chance to take part in this great effort against pediatric cancer. To win the spatula, all you have to do is leave a comment at the bottom of this post and let me know what you'd bake using one of this nifty green spatula. I'll be choosing the winner on Dec 21st at 12:00 noon.PST via random.org Because of shipping rules, winner must be resident in the US. Bravo! Love this post. Love the falling food pictures! Love cookies. I would wear that spatula in my pocket protector like a pen. Good liok for me dontcha think? I stalk you on Twitter. Great cookies and what a great program! I'd make some spicy brownies! How many grams is a stick of butter?